Looking for some retail therapy? It's true; the Cadell Valley near Morgan is the Riverland's best kept foodies secret. You'll really be surprised when you visit us. 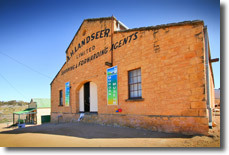 We can offer you the best of all worlds on the Great Nor' West Bend of the Murray River...yeap, we're top of the Murray. Relax and enjoy the flavours of Cadell. Beautiful produce, outstanding wines and unique country town feel. We don't live in the past and know our beautiful valley is just sensational to explore. You'll soon discover Cadell is a great spot to experience the Murray. Cadell offers visitors a general store and licensed community club, or enjoy our riverfront lawns that offer majestic limestone cliff views, a playground and free barbecues. If you prefer to do your own thing, you can hire a houseboat to cruise in the wake of the old riverboats and we allow mooring on our riverfront reserve. The district also has a number of reserves. Not far from Cadell is the Morgan Conservation Park is a favourite haunt for fossil fossickers, while Hogwash Flat Park is recognised as one of the best fishing spots in the region. Attracting international botanists and ornithologists, the wetlands feature unique varieties of prickly bottle brush (Brachiandis) and bird hides. The trail through the wetlands is marked with informative signs about the birdlife and the ecosystem.